He has extensive knowledge of market trends, prices and latest industry innovations. His tertiary studies in building have also enabled him to develop a unique service for his clients as he provides valuable advice on aspects of design aimed at achieving the maximum potential from any project or business venture. Over the years, Napoleon has been involved in development projects varying greatly in size and budget, allowing him to refine his skills and broaden the scope of opportunities. 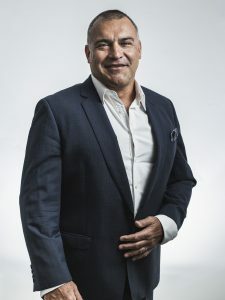 Prior to founding Piper Property Group in 1996, Napoleon was a highly experienced real estate licensee who owned and managed the successful independent real estate company, JFP (formerly known as James & Fear Real Estate) in Sydney’s Eastern suburbs. Under Napoleon’s direction, JFP expanded its property management department to over 1200 properties, totalling over $250m in value, while its project marketing division became one of the most successful of its kind in Sydney, handling sites totalling $250m. Napoleon boasts an impressive record of achievements. As a motivational leader, he has inspired companies to achieve outstanding successes in areas as diverse as construction and property development, commercial and residential sales, and property management. Napoleon is responsible for overseeing the management of Piper Property Groups Affordable Housing operations, along with the development and execution of business strategies. This includes driving and delivery all phases of the property lifecycle form acquisition through to completion. These days Napoleon is close to reaching his goal of providing his clients with a holistic range of services to make becoming an investor an easy and enjoyable process from start to finish.